This completely revised and updated edition of Rosemary Morrow’s highly successful Earth User’s Guide to Permaculture is a straight-forward manual of practical permaculture. Fundamentally, permaculture is design science and in this new edition design is emphasised. This book will be most beneficial if you apply it to the space where you live and work. The same principles apply for becoming more sustainable and living lightly whether you live in a small city apartment with a balcony, in a house with a garden in the suburbs, or on acreage in the country. Included in this new edition are chapters on seed-saving, permaculture at work, integrated pest management, information about domestic as well as rural water usage, a non-destructive approach towards dealing with weeds and wildlife, and designing to withstand a disaster. Earth User’s Guide to Permaculture is suitable for beginners as well as experienced permaculture practitioners looking for new ideas in moving towards greater self-reliance and sustainable living. makes permaculture understandable and practicable Rosemary Morrow lives in Eastern Australia and has taught permaculture design in India, Africa, Thailand and Cambodia. As a result of her considerable skill and experience she has written a first-rate, practical and informative guide to sustainable living. Permaculture was first developed by Bill Mollison and Dvid Holmgren and has since spread exponentially around the world. This book is a very practical guide to help you get started in your locality. While it has an Australian perspective, I have found the vast majority of it entirely applicable or easily adaptable to a Northern hemisphere temperate context. 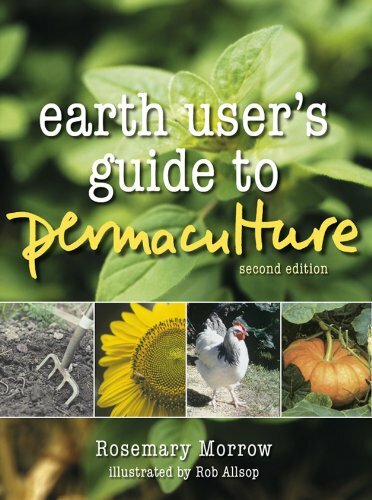 I bought The Earth User’s Guide to Permaculture because I wanted to learn about Permaculture but was intimidated by the price and sheer weight of the key textbook, Permaculture: A Designer’s Manual, by Mollison. I was also unable to participate in a hands-on design course at the time due to work and family committments. What I found was inspiring. I have since completed the design certificate and am now teaching a university course in environmental ethics. There are several strengths to the Earth User’s Guide. First, there are plenty of excellent illustrations by Rob Allsop, so you can see as well as read about the process and principles of permaculture design. The twenty well-chosen colour photographs compliment these. Secondly, the book focusses on two different real-life examples, a small suburban house and an eighty acre farm. Seeing permaculture in action in real places is very helpful. Third, the book avoids duplicating material that can be found elsewhere and instead focusses on the practical. There are project ideas here that could take a morning or a lifetime to complete. As Rosemary Morrow writes in the preface, ‘start now and let your life be enriched’. Great ideas to put principles into practice Morrow and Allsop offer an amusingly illustrated and practical response to other intellectually overwhelming tomes available on permaculture (e.g. Bill Mollison’s “Designer’s Manual”). For those readers who want an easy-to-follow and get-to-the-point manual for designing their property according to permaculture principles, this book is it. An Engaging Primer This is an excellent first read on permaculture. It covers nearly all the bases that Mollison’s intro does (the daddy of the discipline) but brings the somewhat heady concepts down to a tangible, ‘here’s how you can do it’ level. One of the things that I liked so much about this book is that the author doesn’t assume (like many PC writings seem to do) that you live way out in the bush somewhere, with acres and acres to work with, no infrastructure, no other job, and heaps of people working alongside you. She has ideas for those folks, but also for the rest of us who maybe have a small yard, a deserted lot, a community garden space, or just a stoop and a lot of creativity. this is a good book. I recomend it highly.